And I promise an update very soon… Some Food for thought??? Are these dyed fish stocked?? I have witnessed these marks on several fish from different rivers?? We can`t catch all the time!! 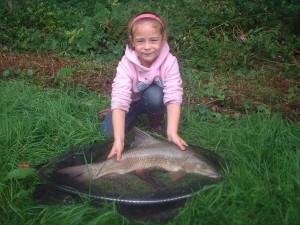 It was the turn of my youngest to try for a barbel,in an afternoon session after our Sunday roast, she had been looking forward to this for weeks, we had great fun up and down banks and roving the Avon. But to no avail even for a chub! The river had been up and the fish feeding in the days before, but for all the anglers we spoke to the same was happening today, nothing. But for Isobel this was not as much of a disaster as it was for me, she loved being out and seeing the wildlife all around us, and looked forward to her tea al-fresco! It was back to school tomorrow so we had to miss that chance into dark, but we stayed till the light was fading and had some tentative pull`s that did not develop. We left with lots of talk about what would be next time!! Body Boards and Wet Suits. We are back from a spell in Cornwall, that`s right catching waves and making a splash whatever the weather!! Though I am itching to get out and have had reports of lots of big barbel to 16lb+ I am unsure of just where now to start my next challenge? 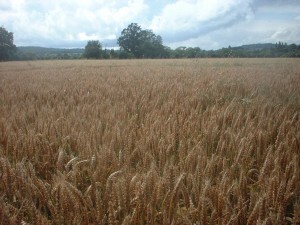 But if that`s all I have to worry about then what`s the worry? 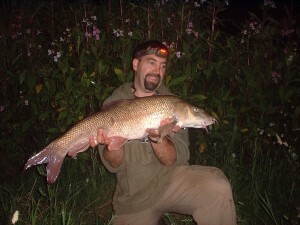 Though last night looked very good for a bite I could not get out, so shall be out very soon and shall post how it goes…. Oh and HAPPY BIRTHDAY John!!! 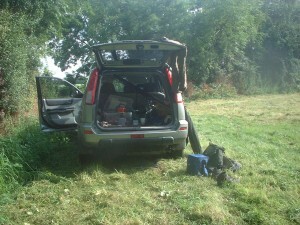 Maggot Madness and A New Section of Severn to Try. 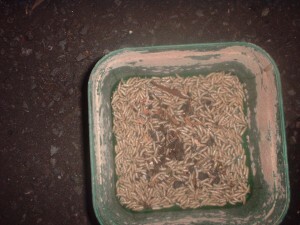 It was late in the evening and my wife had ventured to put the bins out in my absence, only to find maggots pouring from the top of the wheelie! 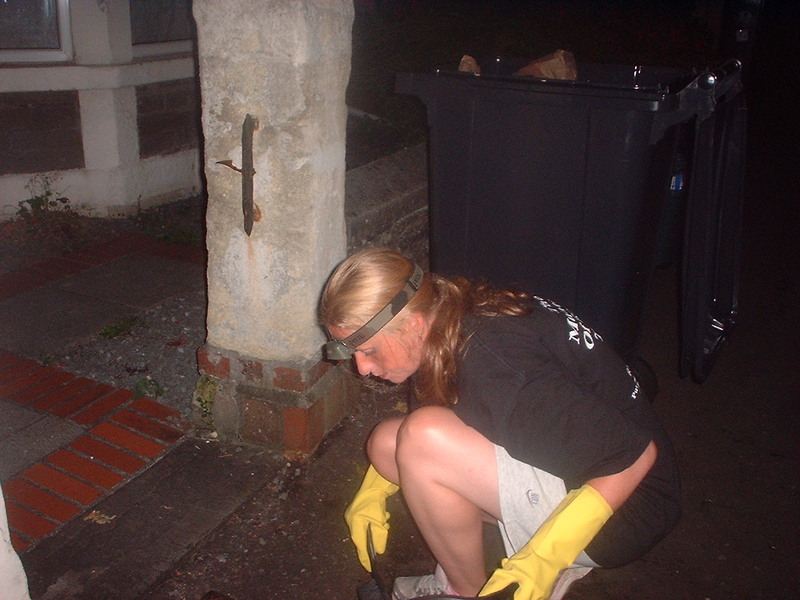 What a laugh, she was mortified and I was telling her not to waste them and to be fair she did well, donning her marigolds and shying away. 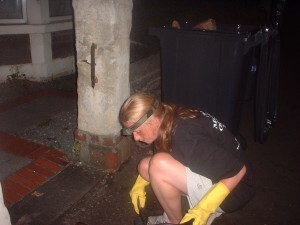 I was shortly home to help, and of course take a picture and have a laugh at her frantic panic that the bin persons may not take our bin. 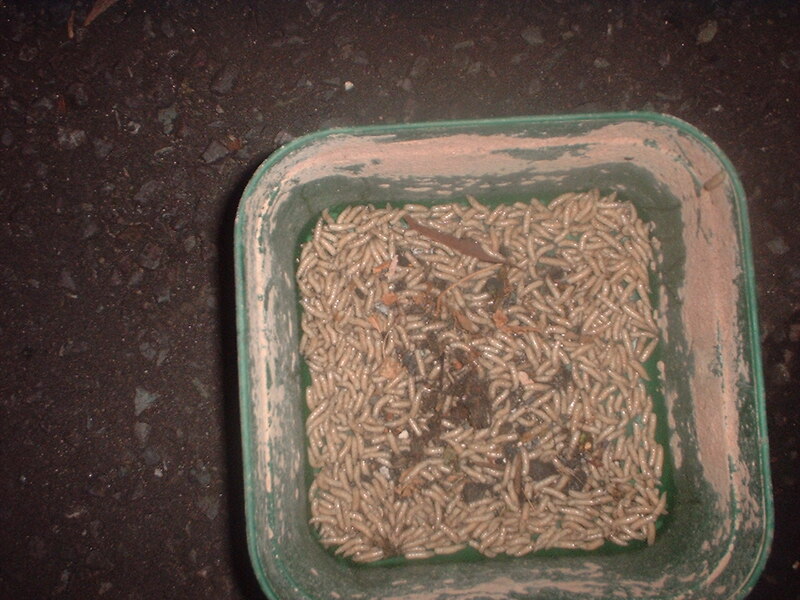 All`s well that end`s well, the maggots are now safely in a box in the bait fridge awaiting their date with destiny. Next day was a short evening session to try a completely new venue on the Lower Severn for Mark and I, the location was said to hold rarely caught large fish. Our timing was not the best with conditions being low and clear and not ideal for the Severn at all, let alone the Lower reaches. The area was really quite remote and very promising, we had only cows for company and not a soul for miles and miles (or so it seemed). 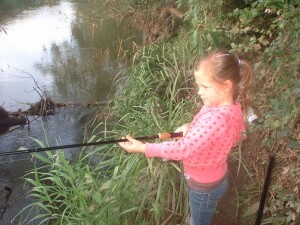 After a long walk and look around we settled on a couple of swims to bait and see if we could get a bite between us, the weather was muggy going into the last hour of sunlight and we were sure a bite would come. 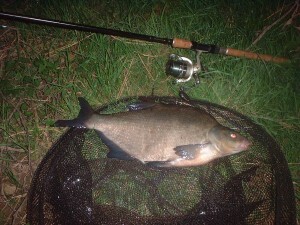 Sure enough as darkness enveloped all around, the tip`s began to knock, and a bite or two came, unfortunately the bites were not the barbel we were after, but Bream! Typical Severn Bream, big and hungry, we had a couple each and decided that this was a result (of sorts) as it was our first attempt and a short one at that. 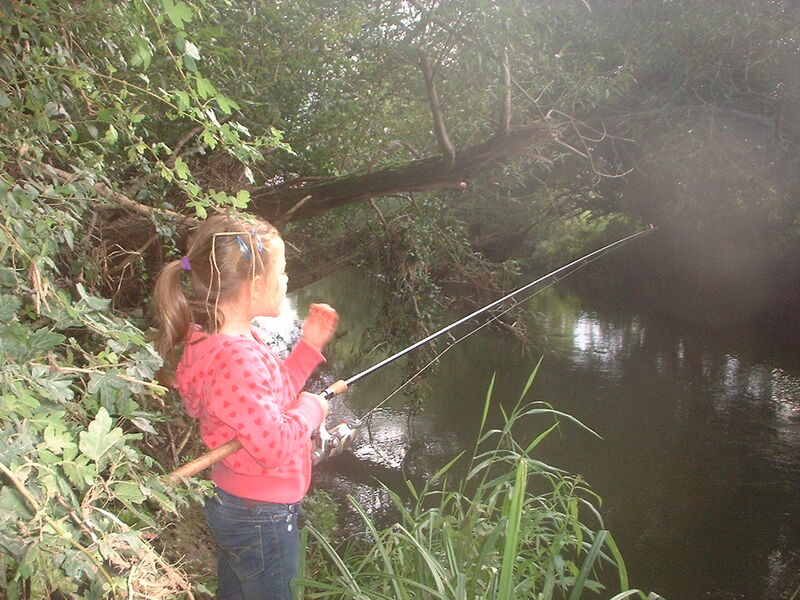 Maybe we shall try again when the river conditions are more likely to be obliging, but for now it`s home work done! Back On The Bristol Avon! 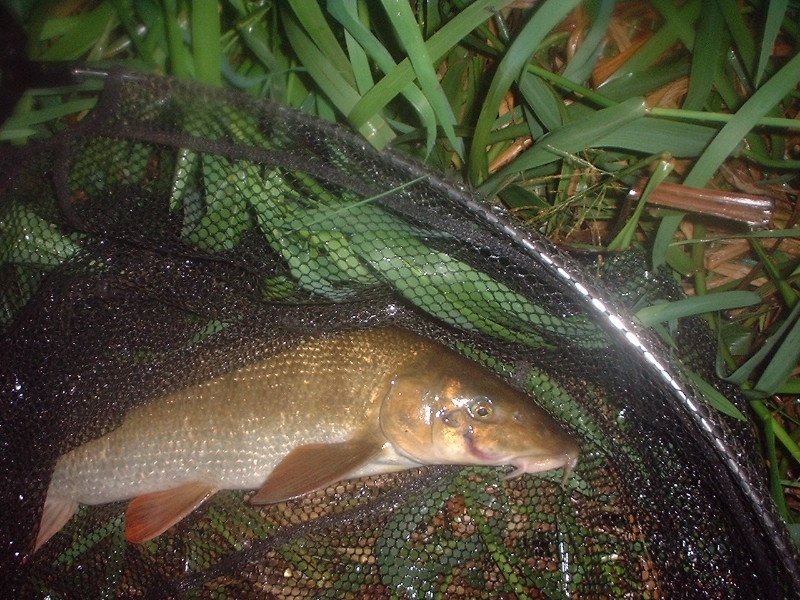 I could not resist the temptation of my local river, and within minutes of just my journey to it, I was feeling quite high and optimistic, (ready to fork out for a local permit). 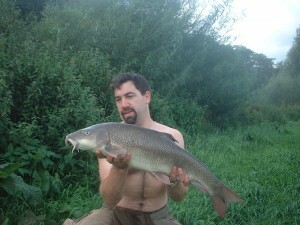 Rightly so as it turned out, the afternoon was warm and sunny and you could see the fish to be targeted. The surroundings are beautiful and only the birds could be heard along with the rippling water, what a day to watch barbel and every other fish behaving naturally in their environment. This does not always mean they will be easy to catch, but it can fill the viewer with confidence for chances of a bite or two. 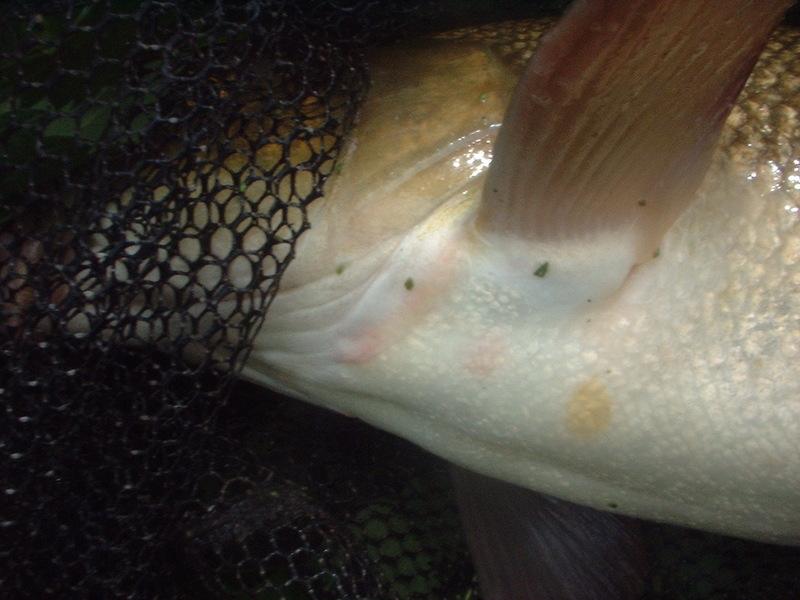 And so it was in this vein that I dropped a line into a swim where 5 minutes before 5or6 barbel from 3.5lb to 10ishlb were avidly feeding. Having set the trap I awaited what I thought would be an instant response, it was instant….nothing. The fish had spooked and it was going to be a matter of getting their confidence back before we could see or hook one, so with regular feed little and often, the barbel could not resist coming back for a look. 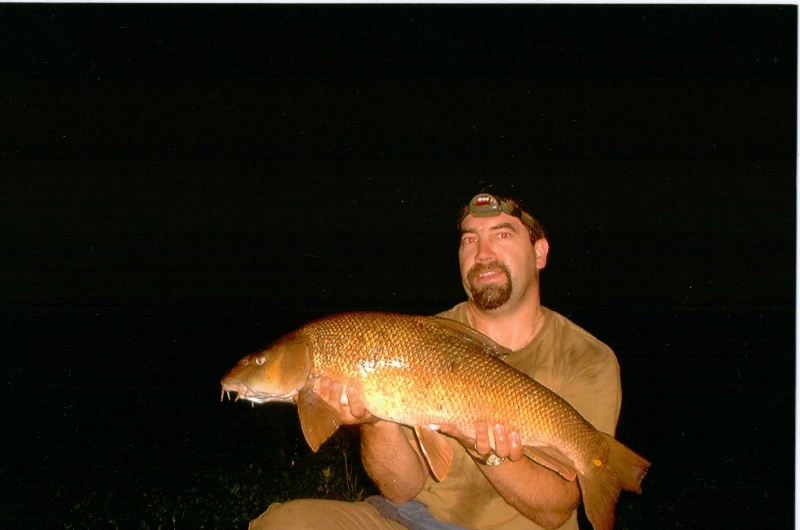 This is when the adrenalin really kicks in, the fish were inches from the hookbait and as I watched fully expecting the lift and bolt from a hooked fish, the fish lifted off and breezed across the river and into the sanctuary of cover. 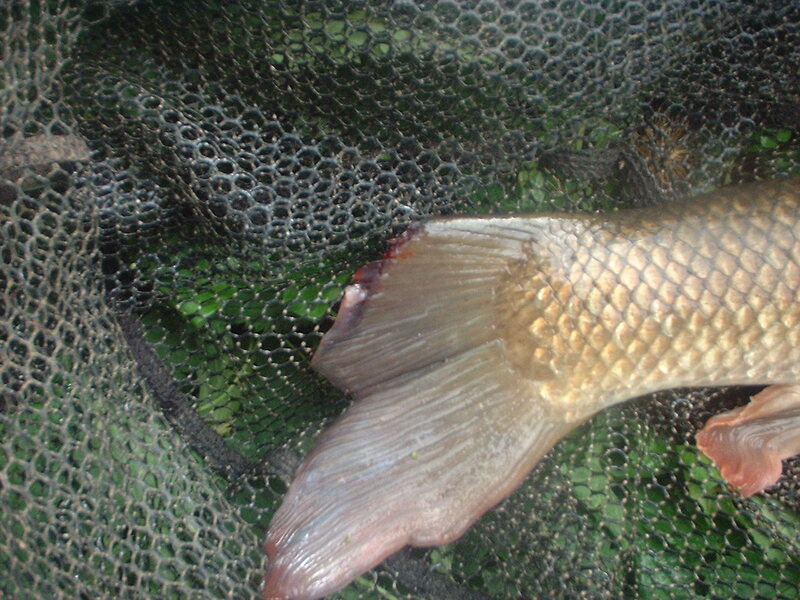 This happened 3 or 4 times in the next hour or so, the need for change was upon me and so I would try bouncing the bait through a faster flowing part of the swim. 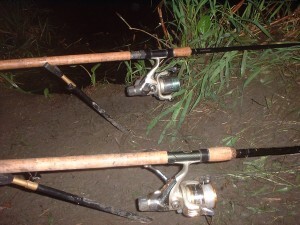 As I did this on the first run through two fish were watching under their cover and they were twitching with interest, the rear fish pounced out and onto the bait, (wrench the rod went) and into the fight we went. 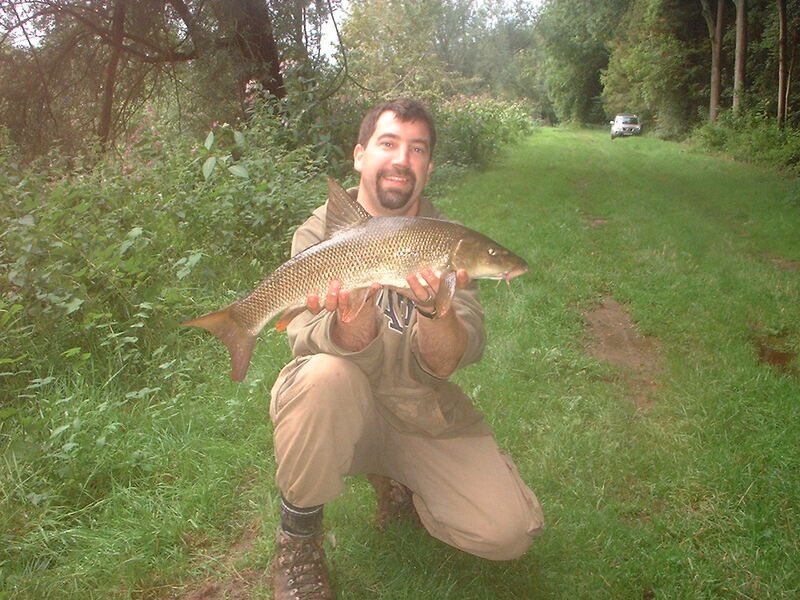 The fish was fast and pulled to run around the midstream rushes using the current against me, we pulled at one another and (because of his size) I got the better of this prime fish! As the sun set on a half decent summers afternoon, I felt completely attached to the surroundings and at one with the environment in which I was stood. With one more cast on dark I tried a meat approach from a different point in the swim, and it only took a few minutes to get a response, a positive pull lead then to a fighting fit fish of 7lb, one of the bigger ones! A wonderful result and a happy angler heading back to the car, for a much shorter drive than of late, and able to get take-away and see my beautiful wife before she had “hit the hay”! A Lovely (bit wet) Day, with my Keen Daughter, and “10” Barbel!! 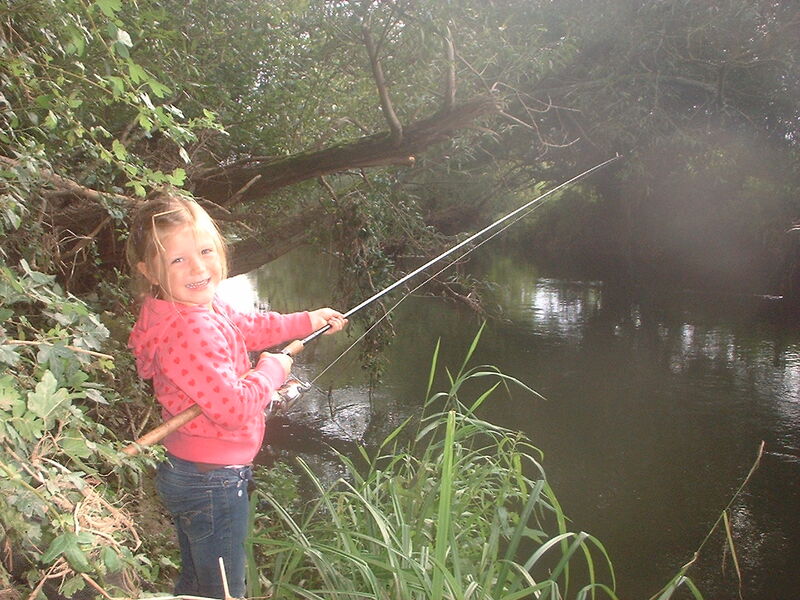 It was my eldest daughter Emily`s turn for a trip out on the banks of some river somewhere which might hold barbel for us to have a go at! The rain came down and made things a little difficult for comfort and for access, but nothing was going to dampen our enthusiasm today. After showing my daughter the ropes she was able to hold the rod and feel a barbel take on our first cast, it was a bit much and too heavy for her really. 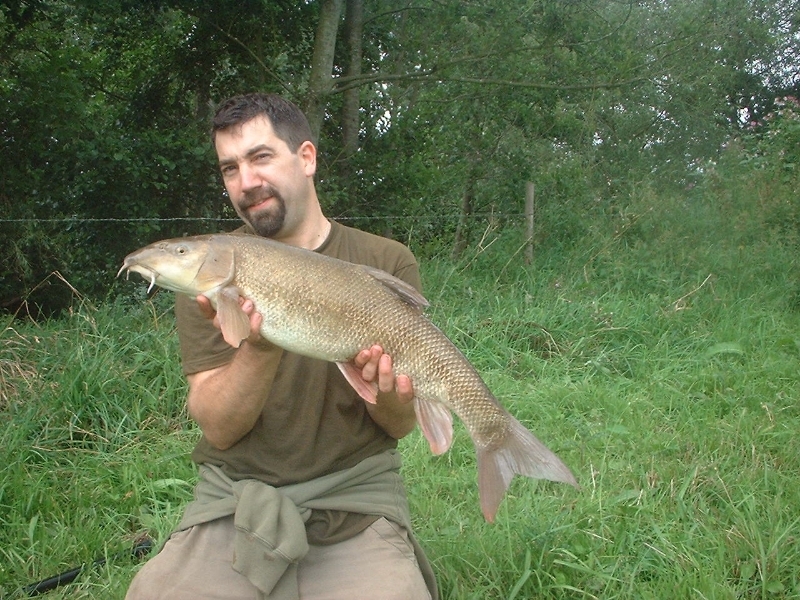 The river was running with a small amount of colour and the fish were willing to feed, so the bites came steadily through the afternoon. 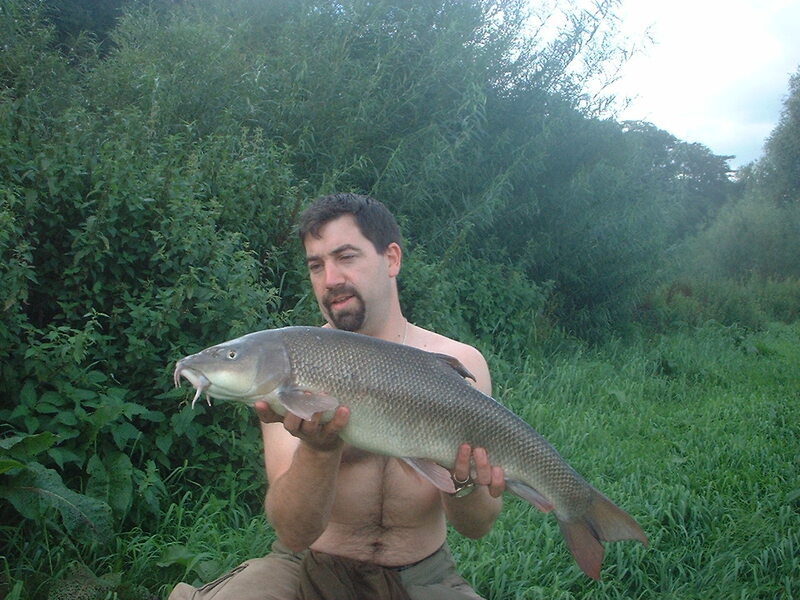 The swim is a typical barbel holding area with a snag and steady flowing oxygenated water to cast to, the fish will come up under the rod tip when they are feeding well, they were not far off on this afternoon! Emily was a tonic to be with, lots of questions and always willing to try, she seemed to thoroughly enjoy the day with dad, she also took these pictures! A photographer in the making! We finished the day on dark with 2 chub and 10 barbel to 8lb, another day to remember when the bites are a lot harder to come by. John had some holiday and we had fixed to take a couple of day`s away, not sure as to where we would go, we would decide on the day. 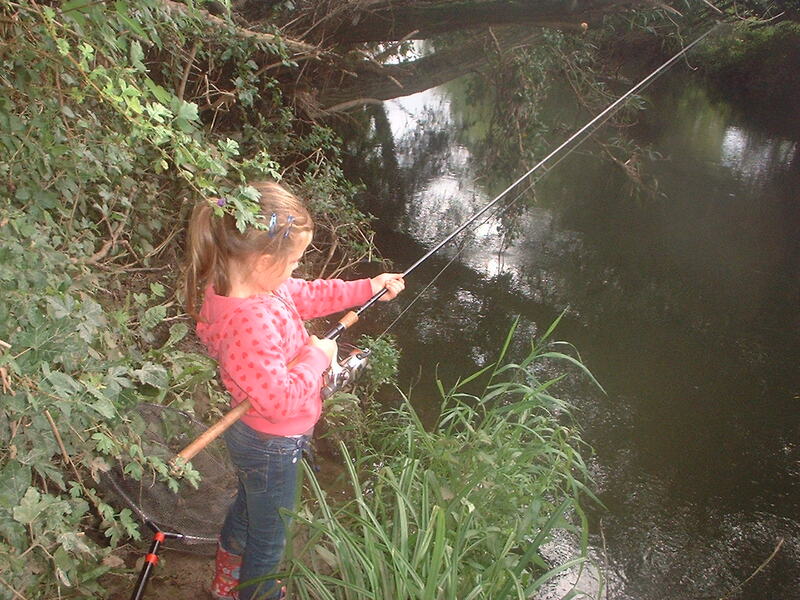 The morning came and over a hearty breakfast we hatched our plans, we would look first at a new stretch of the river Teme and maybe fish it, and then head to an area where this time last year, there were some fish. The new stretch looked very promising for a future trip but not enough for today, as there was a place we thought would hold more for us! The weather was dry but overcast with the threat of steady and persistent drizzle, we parked up in a lane with a fair walk to our chosen swims. Along our way as we chatted with much excitement as to what the coming day`s might hold and general fishing stuff, John was in full flow of conversation when he took his next step and started to go down a ditch. Unperturbed he carried on talking, not realising that the ditch was only going to get deeper, and he fell into a roll onto his back and sank away into the ditch. I am afraid we were too busy nursing our laughter for a while before we could get it together enough to start thinking about pulling him out! As we caught our first glimpse of the river here, the conditions were completely different from the conditions we found at the area lower down. The river was red in colour and had a bit of extra flow on, there must have been a blast of heavy rain further up the valley, so our idea of spotting was out of the question. But for every negative (hopefully) there is a positive! For my first cast, a small feeder with pellet to get some bait into the swim, not 10 minutes after a positive bite and a chub of 4lbs. A good start we thought, and second cast a wrench on the rod tip which was enough to wake me from any thoughts, barbel on! 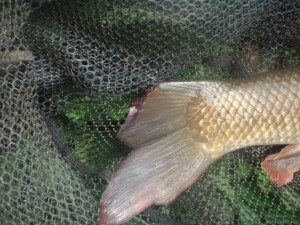 After an impressive scrap diving for cover the above fish of 7lb was netted and a mad afternoon of bites was to follow. The swim I was fishing was a deepish pool and John fished the swim above where he could usually watch them, he had changed tactics from float to lead and had one within five minutes, but then the swim went quiet. 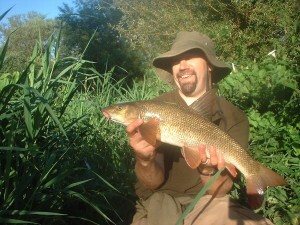 After sitting with me, when holding the rod, we watched the 5th barbel take, John decided to move further downstream for bites. I proceeded to get steady bites during the rain including a bream of 1lb or so, and 3 chub all over 3lb, the biggest barbel so far was a very impressive 9lb 14oz. 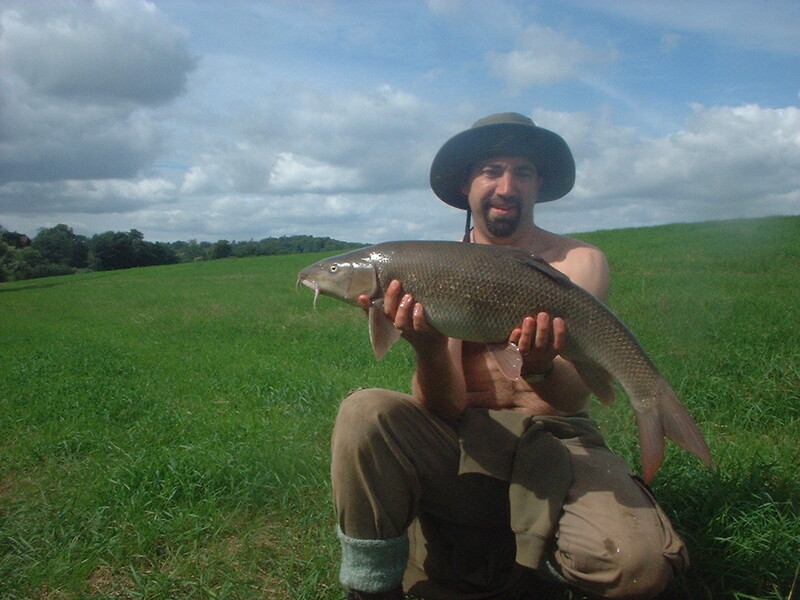 When the barbel tally had reached 9, John having had a skirmish with the cows, dropped in below me and as I waited with him to see if he would get a bite, within 2 minutes the rod went! As John was into his third my rod went, and the fish swam directly for the inside cover below me which was very dangerous looking. 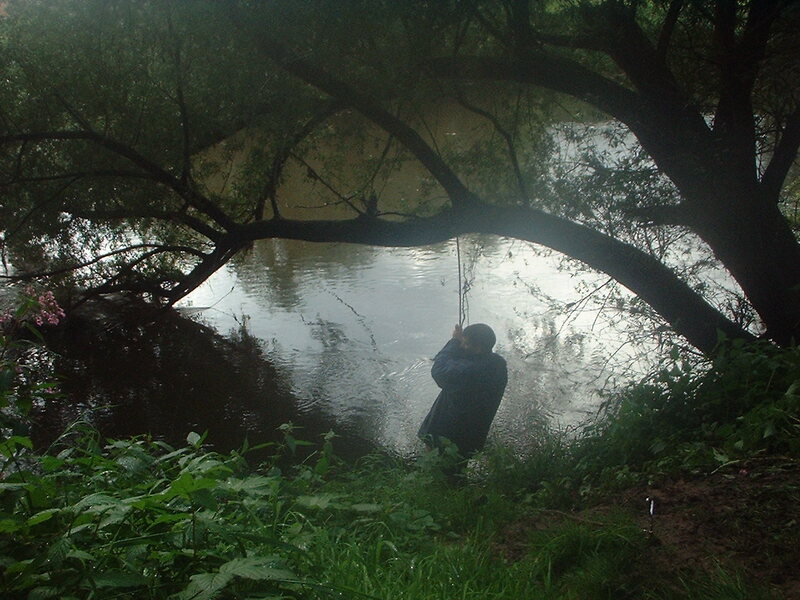 I followed the fish out onto a limb and tried to keep the line from rubbing against the submerged branches, I was in a situation and cried out to John for his help! 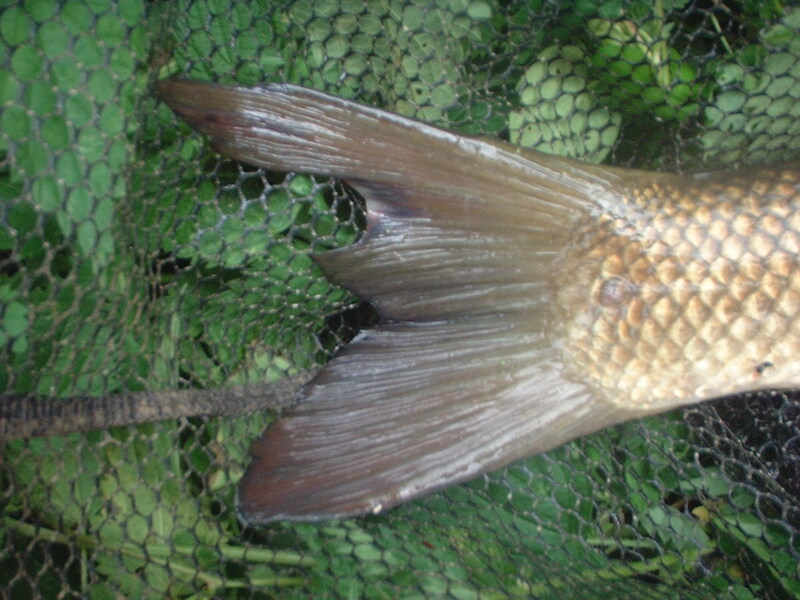 He had to deal with his fish and then come and see my pickle, with disbelief at the lengths I go to, John skillfully netted the “monster” that had caused all this trouble. It was 9lb 9oz and I thought it was much bigger during the whole fight, still it was a stunning fish and the 10th of the afternoon for lucky me. I had another and John a few more too, making it 16 barbel between us (4 over 9lb), an incredible afternoon`s sport for the middle Teme, which has been suffering (barbel numbers wise) year on year. 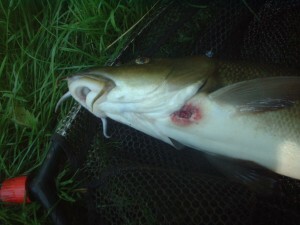 It was worth our noting that many of the barbel had parts of their fins missing, they looked ominously like bites! After that session and before it had got dark, we headed back to the car and out for some food to celebrate a wonderful afternoon in a remote location with lots of ooos and aahs. The next day after a couple of hours late fishing on the Warks Avon and 1 keen barbel to my rod, (I must have stepped in something), we opted for an afternoon on the Severn to get some bait down and hopefully draw some barbel. 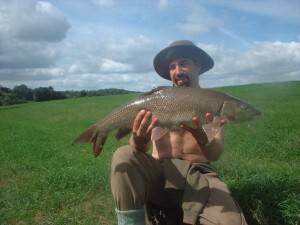 Well to cut this story short, the barbel did not come, this lovely Roach of 1lb9oz did and several Bream also did! For those who do not know what a bream looks like here is one of the slimy fellows, at nearly 5lbs, a small one for the Severn. 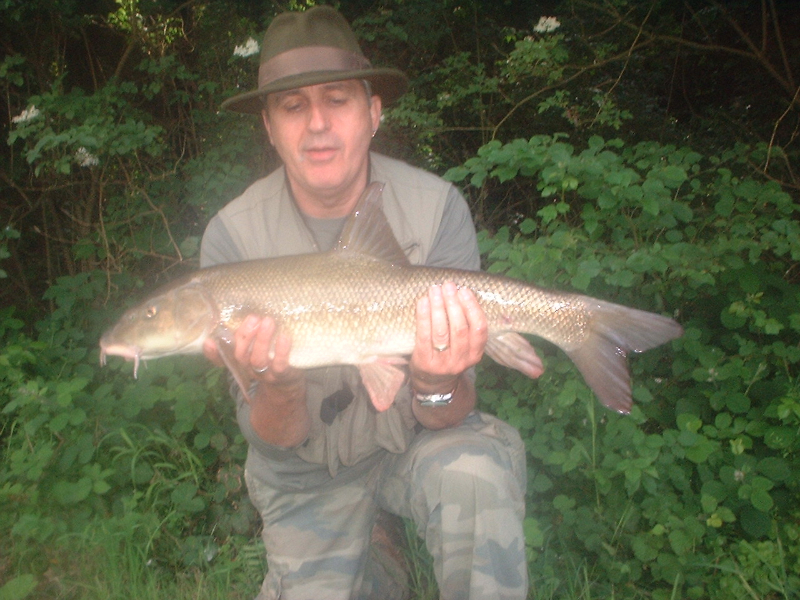 It was a great couple of day`s, and I thank John for his great company (as ever) and we all know it`s not just about catching fish, but when you get day`s like that, you won`t forget them!! 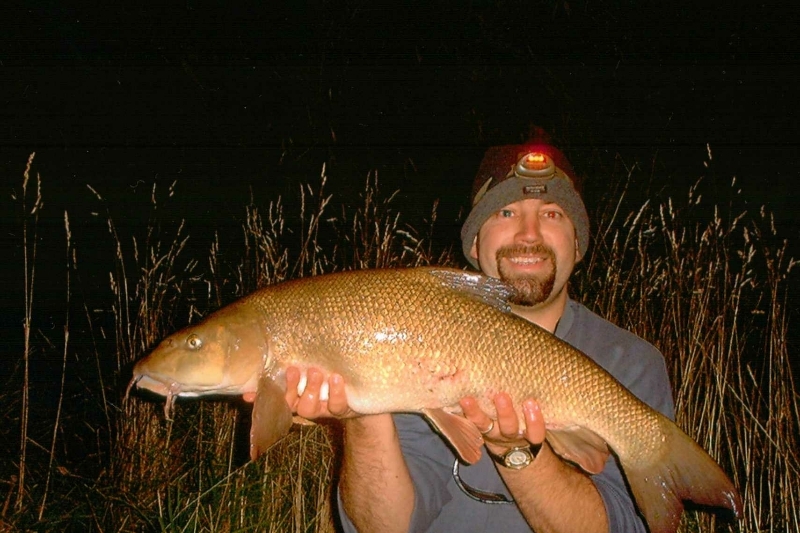 Anyway to the latest escapades around the rivers, yes on Wednesday night I was out to catch a couple of barbel and sleep then in the car to have a day on Thursday looking around a different river close by. So starting just before dark on the Avon I had interest almost from the off, unfortunately for a barbel angler it was bream and not just the odd one! 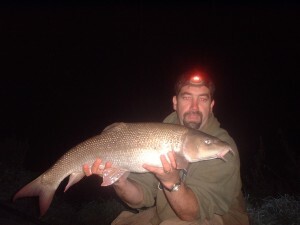 After a couple though, the bite came from a barbel of 9lbs and great fun in the darkness which had just set in, as it was, the plan would be to stay and fish until 2ish depending slightly on the action or lack of it. 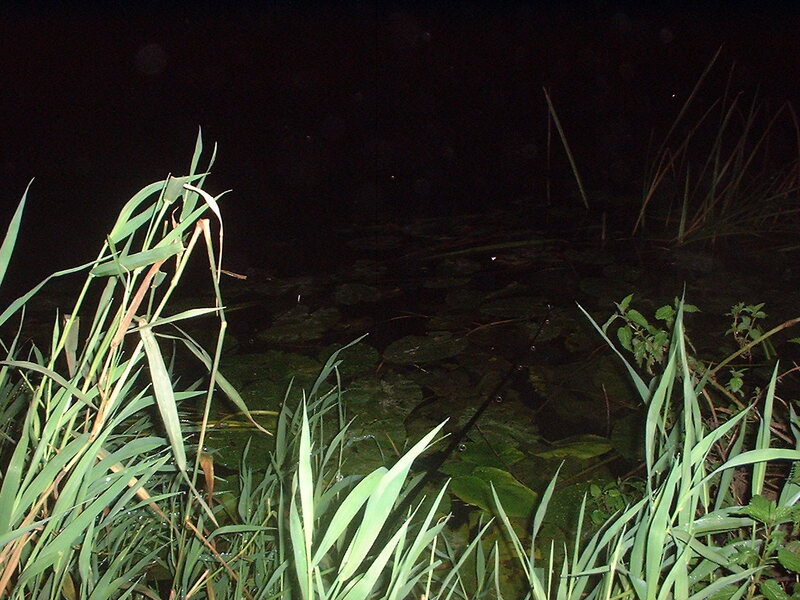 (Spot the Rods). The rods were poised for action and they were certainly getting some, after 4 bream and the one nice barbel, a second fighter put in an appearance it was just under 6lb and had what looks to be hook scars on the side of its face. The fish seemed none the worse for this wear, and was ready to fight another day when it swam off with a kick of tail to say goodnight! 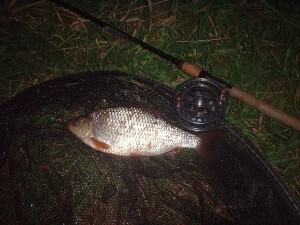 To my surprise more bream came, even from other swims, but before sleep one more prize fighter did show. Tonight though was not the night for the potentially big fish in this area, though it was as much fun as I would have expected before the start. Sleep came easy at near 3am in the car after almost falling asleep watching the rods, a pleasing night with a feeling of anticipation for the next day… Waking up at 9 or so I was pleased to have slept so well in my dry spare clothes, and set about drying the wet ones over breakfast! Off later today to the next spot where I had not visited yet this season, to see if any fish were there anymore, the sun was shining and just some threatening clouds drifting by to worry about. The drive was not a long one and I managed what is becoming a regular stop at the farm shop on the way, for free range family provisions. The stretch this time was a less popular one for the middle Teme since what seems like a devastating decline in numbers of fish due to whatever reason, everyone has their ideas, but the amount of bank side prints suggests something of its own.. 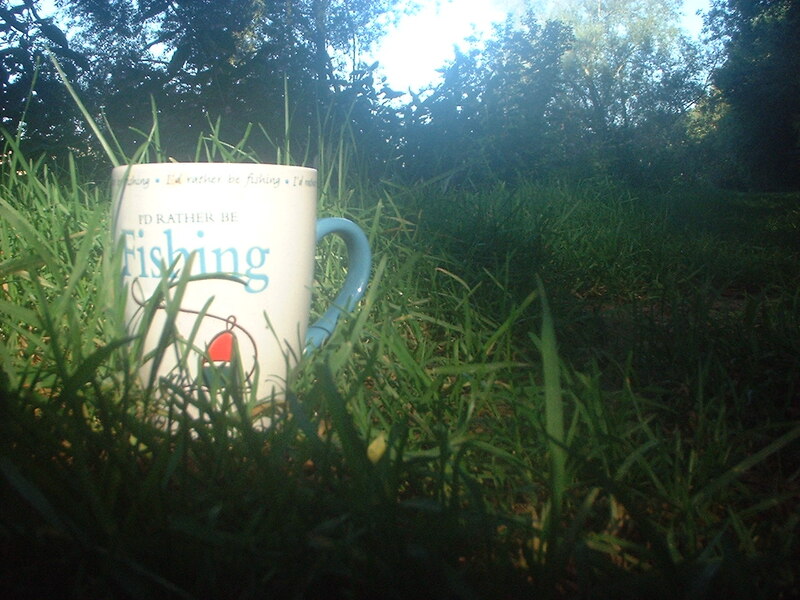 Regardless of this I love the fishery as it holds peace and tranquility, total wildness, and swallows ducking and diving during the heat of the afternoon over the river, after the – just hatched – flies!! 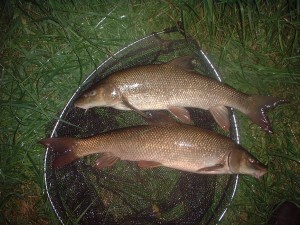 Luckily for all, there are some fish left, and I was lucky enough to hook a couple too. 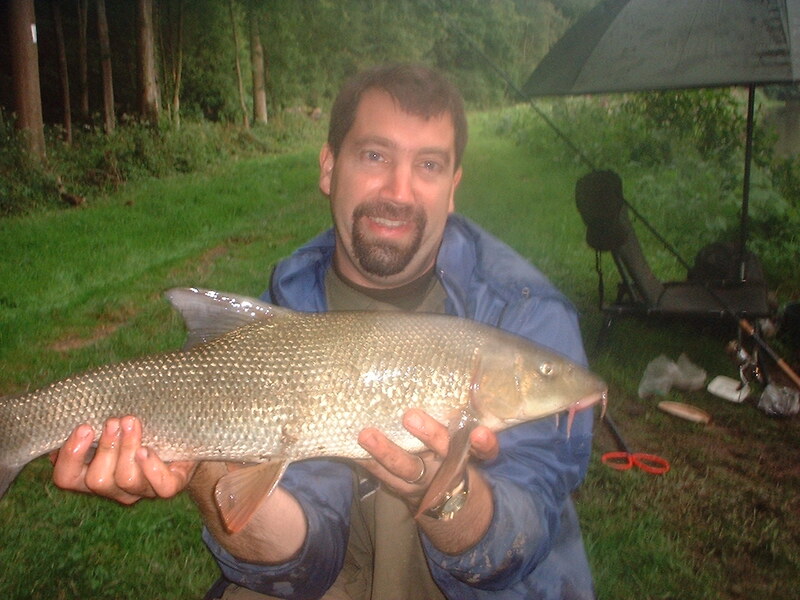 The first one was just as the rain slowed from an almighty thunderstorm, it was the first cast and had been in the water for 20 minutes or more and I was thinking another cast would be needed when the rod did what it does so well……WHACK! A lovely afternoon was spent trying, walking, and trying again with some success, 2 nice barbel, 2 chub, and one hook pull on a determined barbel setting off for the inside snags!! 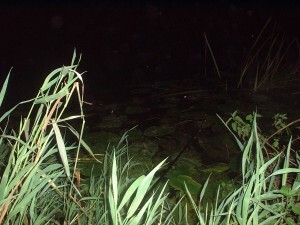 The thunderstorms were spectacular, and watching the flies hatch two foot under the surface and flying to freedom above the water, only to then be taken by the fast swooping swallows in all their elegance. All too soon, it was time to get back. And so again it was the turn of the Teme for a visit, for a big fish? Maybe! The sun was high and the hopes were too, this time I might be able to spot some fish for the first time this season, or not. 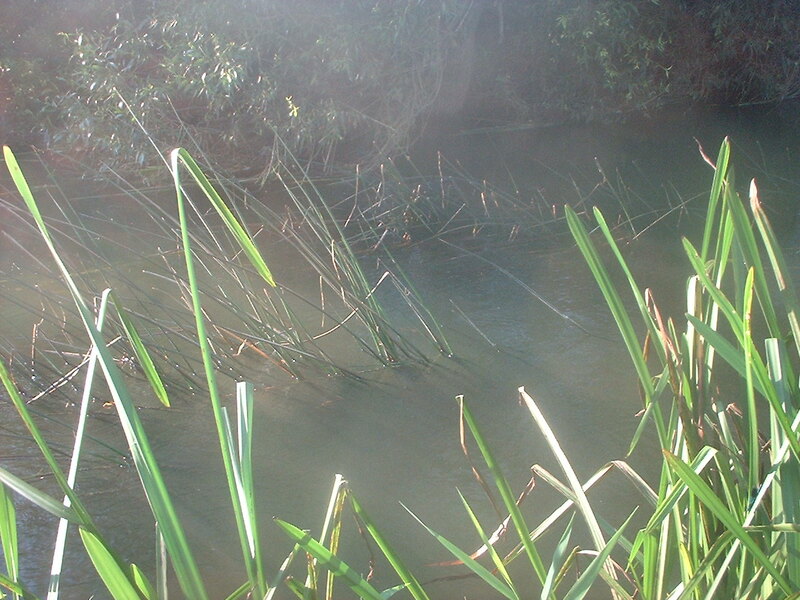 It was early afternoon and the warm part of the day when often the fish will feed, the river looked great, the banks not so because they were carrying a lot of debris and flotsam from all the extra water over the past weeks. 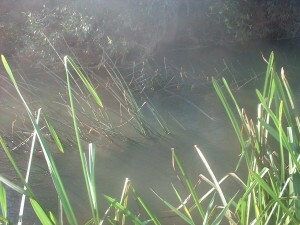 Still the river was not yet clear enough to even see shadows, which was a shame but that’s the way it goes. 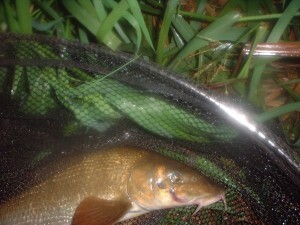 The fish were still willing to bite and I had a few nice ones which included a chub that had to be weighed as it`s frame was huge, it went 4lb 9oz. Before long, it was time to decide on the swim to watch it get dark in. The kingfishers were active, the birds singing, and all was well with the river. The hour was spent without much activity until 9pm, when the rod arched to that “alarm bells” point and we were in business….Even after a great tussle earlier in the day from an 8lb fish, this fish was putting up the fight of the season so far, and after some runs to inside cover and a rub or two against the submerged branches, the fish was not giving up! As the flow fought with us both the fish came close enough to be netted, and as it did I missed it, and almost saw the last dive but the hook hold was good, though the line was frayed from the rubbing. 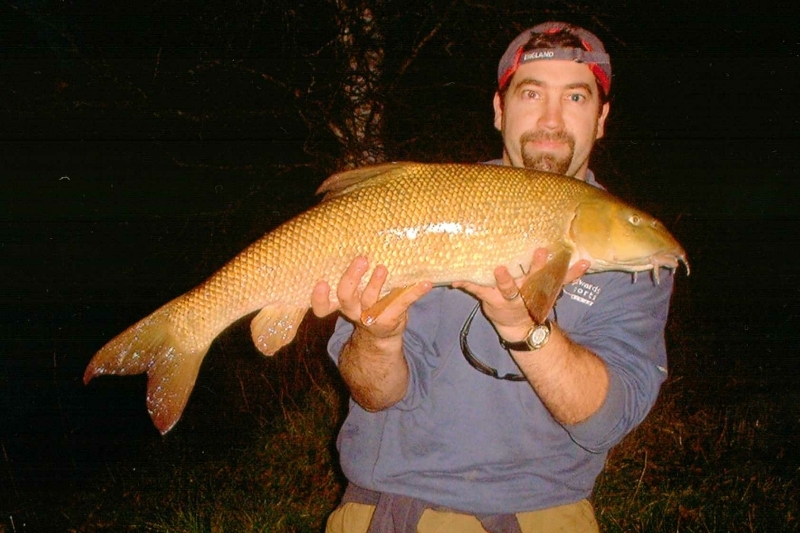 The fish was very long and big framed and weighed 11lb, just two ounces short of my best from the Teme caught a few years ago! I was beaming for the whole journey home and still am now, it`s amazing how these day`s can surprise us. Now which river did I say next?